Great for night time comfort I often find it difficult to get to sleep due to the gritty, prickly symptoms of "dry eye syndrome". Luckily, since I tried Clinitas hydrate, things have improved greatly. I use it at night immediately before going to sleep - it does blur vision so no use applying it and then trying to read a book! It lasts all night long and I wake up with refreshed, soothed eyes ready to start the day. I really love this treatment although it is pricey for a tube which only lasts 1 month. Tears are the natural mechanism that our bodies use to hydrate our eyes. However, sometimes when we are wearing contact lenses, our tears are not enough to moisturise our eyes, resulting in irritation and discomfort. Clinitas Hydrate combats the symptoms of dry eyes, lessening this discomfort and ensuring that the eyes of contact lens wearers are kept moist and comfortable all day long. • Apply in the evening before retiring to sleep and wake up feeling bright and refreshed. 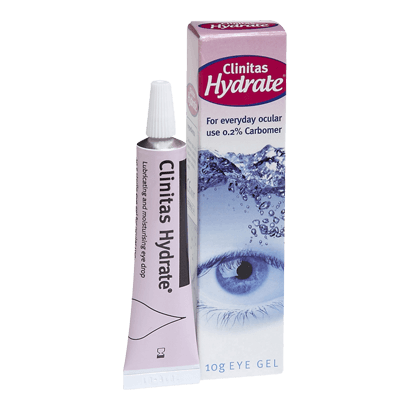 Or apply the Clinitas Hydrate gel drops during the day for an instant vision boost. • Uses 980 Carbomer to simulate the action of natural tears, moisturising the eye without risking irritation. • The gel has been formulated to possess adhesive qualities so that it quickly spreads across the whole surface of the contact lens to ensure that the whole eye is moist. • Guaranteed to be a long lasting and effective way to improve comfort for anyone who suffers from dry eyes. • Clinitas Hydrate comes in a 10g tube which should last for one month, assuming normal levels of usage. Hydration is as important for the eyes as it is for the body after exercise, so don't let your eyes miss out! Regular use of Clinitas Hydrate at night can result in vast improvements in vision during the day for all types of lens wearer.